Did King James Order His KJV Translators to Conceal the True Meaning of Baptism? 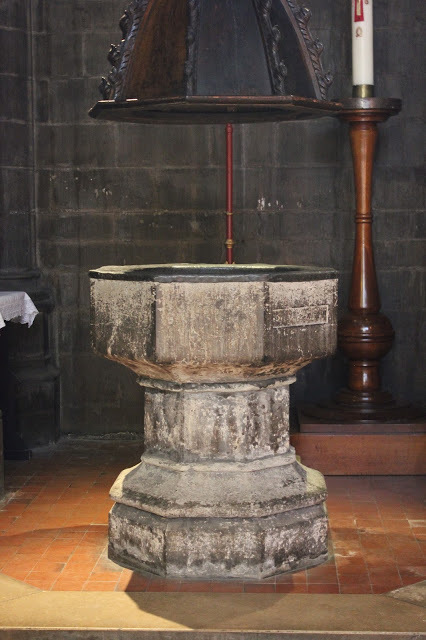 A baptismal font in England, dating back to 1405, large enough to be used for full infant immersion, throughout the Reformation period. Note the table top on the left hand side of the photo, to gain some perspective as to how big this baptismal font really is: Saint Bartholomew the Great Church in London. This might be a bit nerdy, but it is a pet peeve of mine: Is the proper mode of baptism by pouring, sprinkling, or full immersion? What follows is an example of how an arguably plausible theological doctrine can be improperly justified with a flawed piece of historical “evidence.” The actual history of baptism is far more interesting, and it makes for a good rallying point for discussing the Scriptural mode of baptism. The problem with leaving “bapto,” or our “baptism,” untranslated is that it has encouraged people to interpret the word however we imagine it to mean. As a result, this ambiguity about “baptism” has led English-speaking Christians, since the time of King James, to be unsure as to how baptism should be practiced in the churches. Should we practice sprinkling, pouring, or full immersion? Readers of the King James Version of the Bible, the pastor concludes, are left in this state of confusion. What a tragedy. Well, when I heard this, my fallacy-o-meter started to register near the red-zone. I will not link to his sermon, as this is pure bunk. Things like this just annoy me…. Baptism is a frequently rehearsed discussion in the history of the church. I wrestled with this myself, as I was baptized as an infant, only coming to faith later as a teenager, unsure if it was permissible for me, or even necessary, to be baptized again as an adult. The growing trend, among evangelical believers today, only supports “believer’s baptism;” that is, baptism for believing adults, or older children, only. I get that. But my purpose here is not to argue one way or another regarding the proper timing of baptism. My point is this: There are some very strong evidences that one can cite to support believer’s baptism, by immersion alone. Unfortunately, this is not one of them. This YouTube pastor’s particular argument, about the King James Version of the Bible, is sadly a prime example of using anachronism to make a case, that has no historical validity. In the pastor’s defense, he might have read this particular argument, against infant baptism, by citing some source that claimed to be authentic. We can all thank the Internet for that. But I have learned that it really pays to do your homework when you advance a particular claim like this, that has the ring of a conspiracy theory. Is there solid scholarship out there that confirms such a claim? Is there really any substance to the idea that King James purposely ordered the KJV translators, in 1611, to conceal the true meaning of baptism, in order to allow for the Anglican practice of sprinkling infants to go unchallenged? Baptism, by immersion, of infants was regularly practiced by the Church of England, from centuries prior to the 16th century, until towards the end of the Reformation era (see photo at top). The word “baptism” was in regular use, well before the era of King James, in the early 17th century. See this example of Acts 19, from John Wycliffe’s 14th century translation of the Bible into English. The King James’ use of “baptism,” instead of “immersion,” was part of a long-standing tradition. Most informed Baptists recognize that both King Edward and Queen Elizabeth were immersed as infants, for their baptism, in the 16th century. In the original preface to the King James Bible, in 1611, the translators had this note as to why they preserved the word “baptism” in their translation: “We have on the one side avoided the scrupulosity of the Puritans, who leave the old Ecclesiastical words, and betake them to other, as when they put washing for Baptism, and Congregation instead of Church.” The King of England might have prescribed these instructions for his translators, but not necessarily for the reason cited in the sermon given by the pastor, whom I will not name. Several editions of the Book of Common Prayer, give detailed instructions as to how infant baptism was to be performed: “The priest shall dip him in the water, discreetly and warily; but if they certify that the child is weak, it shall suffice to pour water upon it.” Therefore, in some cases, the pouring of water was allowed for infants, as a substitute for full immersion. Heated plumbing was not available for churches in the cold climate of 16th century England. You can consult the second prayer book of King Edward, 1551, the first prayer book of Queen Elizabeth, 1559, and the prayer book of King James, 1604. Here is an example of the same instructions, as late as the 1786 version of the Book of Common Prayer, proposed by the Episcopal Church in the United States. If you want to know where the idea of sprinkling came from, as opposed to full immersion or pouring, you can blame the Westminster divines in 1648, long after James I of England died in 1625, long after the King James Bible was finished in 1611. Article III of chapter XXVIII of the Westminster Confession of Faith states, “Dipping of the person into the water is not necessary; but Baptism is rightly administered by pouring, or sprinkling water upon the person.” The Confession cites Hebrews 9:10,19-22 for Scriptural support. Classically, Presbyterians affirm the Westminster Confession of Faith. True, the Church of England did advocate infant baptism, as opposed to “believer’s baptism” alone, as practiced by the Anabaptists. But the standard had been to fully immerse infants, a practice that had been endorsed for centuries. The practice was moderated to allow for pouring, and eventually sprinkling, out of concern for the baby’s health, and not out of some desire to wiggle out of the supposed clear teaching of Scripture. Today, pouring or sprinkling might be preferred to avoid freaking out the parents. If you really want to press the matter, you should blame the English Puritans, who followed John Calvin closely, for paving the way for the sprinkling of infants, and leave King James, who was not wholly enamored with John Calvin, out of it. As mentioned above, this does not fully address the question of whether or not infant baptism is taught in the Bible, and space does not allow me to address this question. As to the mode of baptism, or how wet you get, it is of no consequence. There is no Scriptural source that indicates that certain persons will be barred from God’s heaven, simply because of a lack of water used at baptism. Immersion is preferred, but then, the baptismal pool in our church is fed with warm water, and I do not live near the Arctic Circle. Furthermore, I am not a “King-James-Only” person. Far from it. My point is simply to say that if you are going to make a case for a particular doctrinal position, at least do your homework to make sure that the evidence you are trying to present has any verifiable substance to it. Otherwise, it makes your line of reasoning to support your larger argument sound foolish. However, if you want to fault the Anglican Church, Presbyterians, or other traditions, that today rarely practice immersion and instead typically adopt either pouring or sprinkling for infants, go right ahead. The Eastern Orthodox, in comparison, are not so squeamish, as many, if not most, Eastern Orthodox practice full immersion for infants. This entry was posted on Saturday, May 19th, 2018 at 7:00 pm	and tagged with baptism, infant baptism, mode of baptism, pouring, sprinkling and posted in Topics. You can follow any responses to this entry through the RSS 2.0 feed. « The Jerusalem Question: What is “Covenant Theology” vs. “Dispensationalism”? I am curious, when and how was “king James” baptized? Everyone seems to have an opinion on the word “baptism” and its use in the KJV – but what about the man who commissioned the work? What was his background, tradition and did he accept that as proper and the norm? Hi, Glenn. That’s a good question, as to the mode of King James’ baptism (sprinkling, pouring, immersion) himself. I am not sure on that one. What we do know is that he was not keen on the Puritan terminology of “washing,” as a different translation for “baptism,” as that was perceived as a way of undermining church authority, by possibly subverting the sacramental authority of the church. We can reasonably infer this since he strongly rejected the idea of translating the Greek word “ecclesia” as “congregation,” as Tyndale did, insisting on the word “church” instead. Likewise, he insisted that “episcopos,” which is today typically translated as “overseer,” be translated as “bishop.” Since James was the head of the Church of England, he thought it important that his church retain sacramental authority for all of his subjects. James is famous for saying “no bishop, no king.” And since he was king, he would have bishops, whom he could supervise and control. Alister McGrath covers a lot of this material in his book, _In the Beginning: The Story of the King James Bible_, which I would highly recommend. Well, I am curious as to why you ask the question. Does King James’ position on the mode of baptism really matter? After all, James only “commissioned” the work of the KJV because his Puritan subjects petitioned for him to put forward a new translation, and he would only sanction such a new translation, if he were to have a hand in crafting it. Thank you for dropping by and commenting at Veracity.